Focus of visit to be on modern slavery and human trafficking. The Archbishop of Canterbury Justin Welby will meet Pope Francis during a visit to Rome from 14th to 16th June. The visit will focus on the joint initiatives against modern slavery and human trafficking launched by Archbishop Justin and Pope Francis which was launched last March. In a statement at that time Archbishop Welby spoke of the efforts between Anglicans and Roman Catholics since 1966 in serious and prayerful dialogue with each other. “We are now being challenged in these days to find more profound ways of putting our ministry and mission where our faith is; and being called into a deeper unity on the side of the poor and in the cause of the justice and righteousness of God,” he stated. He said that the more Christians and other religions share the pain and oppression of the poor and suffering in the name of God, the more God will draw them closer to each other, and this common strength will support them in making a difference. On his next visit in June the Archbishop will visit the Anglican Centre in Rome and hear about the new international Anglican Roman Catholic Commission on Unity and Mission website. He will also see a church-based refugee project, visit the Sant’Egidio community mission and hear about poverty projects. He will call on members of the international ecumenical Catholic foundation Chemin Neuf, four of whose members took up residence at Lambeth Palace earlier this year, and visit the Monastery of San Gregorio al Celio for ecumenical vespers. The Papal meeting will take place during the final morning of the visit. 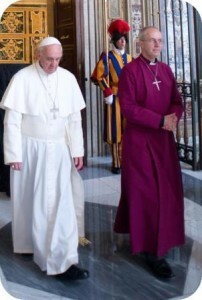 Archbishop Welby previously met the Pope at a private meeting last year, just after they had become Archbishop and Pope respectively in June 2013. The Pope told Archbishop Welby that the closeness of their inaugurations meant “we will always have a particular reason to support one another in prayer”. He said that the prayer for unity gives a fresh impulse to daily efforts to grow towards unity, which are concretely expressed in cooperation in various areas of daily life. “Particularly important among these is our witness to the reference to God and the promotion of Christian values in a world that seems at times to call into question some of the foundations of society, such as respect for the sacredness of human life or the importance of the institution of the family built on marriage, a value that you yourself have had occasion to recall recently,” said Pope Francis. Speaking of the Episcopal ring famously given to Archbishop Michael Ramsey by Pope Paul VI in 1966 the current Archbishop of Canterbury Justin Welby said it represented the links between the Popes and Archbishops of Canterbury for the past fifty years.